Sunday the 17th of March is St Patrick's Day. The day everything turns green. Even in London baby. 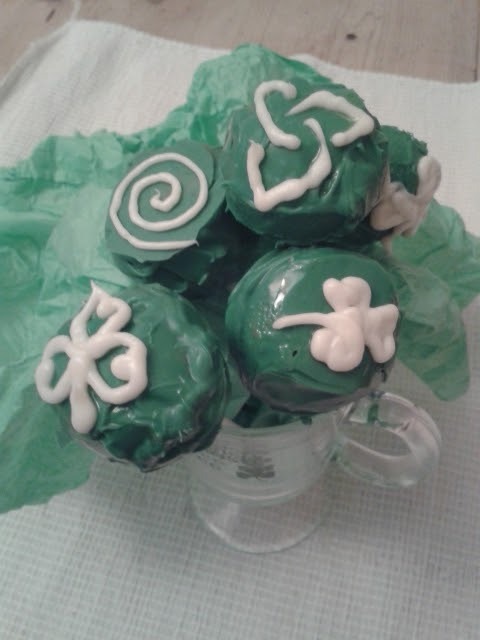 So if you're hungry, you can make some soda bread, or if you want to serve something a little less traditionally Irish, you can try some green cake pops! Cake pops made using Victoria Sponge and Vanilla Buttercream, with Green and White Wilton Candy Melts (from Sugarshack). Disclaimer: I will be going to a cake pop class next week, so I promise to improve my cake pop technique. Disclaimer: Making cake pops (even green ones) under the influence of alcohol make it by default a traditionally Irish recipe. Disclaimer: I am Irish. And under the influence of alcohol. Great craic.